The Time is a funk and dance-pop ensemble formed in 1981 in Minneapolis from two Twin Cities funk units, Flytetyme and Enterprise. Vocalist Morris Day infused his cocky, swaggering personality into dance hits and the band managed to do something unique with Prince's genre-busting innovations. By 1982, the group had already established itself as one of the hottest bands working the live circuit. In 1983, Jimmy Jam and Terry Lewis were fired from the band, after pursuing a career as producers. The band split in 1984 When Morris Day left. The original six members (plus Jerome Benton) reunited in 1990 but despite expectations, the reunion only brought moderate success. In 2008 The group did a live stint in Las Vegas with the original line-up. In October 2011 they released a new The Time album Condensate without any Prince input. The album was released under the new moniker The Original 7ven, as Prince owned the rights to the band name The Time. The band split once again shortly after. Albeit not enrolled in the original band, but as a valet/bodyguard for Morris Day, Jerome Benton soon became a full-time member of the band, when on the road. After 3 of the original members left the group in late 1983, a new The Time band was assembled by Prince around the remaining members. The band was assembled under a clause in Prince's contract with Warner Bros. Records that allowed him to recruit and produce other artists for the label. Allegedly inspired by the 1980 film The Idolmaker, about the life of music promoter and producer Bob Marucci (the Svengali figure behind such 50s/early 60s teen idols like Fabian and Frankie Avalon), Prince decided to put together a poppy funk group that would serve as a pet project and an outlet for further material in the vein of his own early albums, while he himself went on to explore other genres and styles in his own career. After Prince used a groove by his childhood friend Morris Day to create, "Partyup", on his Dirty Mind album, he promised to give him a band with a contract in return. Prince and Morris Day formed the band in 1981 by recruiting members of two already existing Minneapolis bands : "Flyte Time" (from the Donald Byrd song), which featured Jimmy Jam and Monte Moir on keyboards, Terry Lewis on bass and Alexander O'Neal as a singer and Morris Day’s band "Enterprise Band Of Pleasure" on which he was a drummer with Jesse Johnson on guitar (O’Neal has also been the singer of "Enterprise Band Of Pleasure" and another group called "Black Market Band"). Prince first offered to James Behringer to be the guitarist of the band but he declined. Jesse Johnson from Rock Island, Illinois originally came to Minneapolis when Prince was auditioning for a bass player after André Cymone left his band. Prince thought Jesse was a great guitar player, but he was looking for a bass player so he told him to stick around instead, after which Jesse joined Enterprise Band Of Pleasure initially. The first name chosen for the band (with Alexander O'Neal as the singer) was The Nerve. O’Neal recorded two or three songs at Prince’s house (including Rough) but was evicted shortly after the band was assembled. He demanded too much money and confronted Prince and Morris Day for leaving Jellybean Johnson without a band. Jellybean Johnson (not related to Jesse) was the drummer of "Flyte Tyme" and all the member of the group were recruited for The Nerve except him. Prince chose to replace Alexander O'Neal by Morris Day as the singer of the band and took Jellybean Johnson as the drummer (replacing Morris). The Time was born and the recordings began. Terry Lewis' cousin Jerome Benton, joined the line-up as 'valet' after the release of the first album and first few shows. The band went on to release four albums (mostly performed by Prince & singer Morris Day alone) during the course of their main career, each a solid slice of jam-based, rock-infused 80s funk, generally light and humorous in tone, strongly influenced by Parliament. Although they scored numerous hits (including "Get It Up", "Cool", "The Walk", "777-9311", "Jungle Love" and "The Bird", mostly on the R&B charts) during the early 1980s, they never reached super-stardom. But even when good musicians, they didn't play a single note on their debut album. Prince recorded all the music himself, crediting the production to Jamie Starr and Morris Day, who was at least singing on the record, but was expected to follow Prince's guide vocals note-for-note. A growing rivalry began to develop between The Time and Prince's band as they toured with Prince during his 1981/1982 Controversy Tour. Frustrated with their lack of input on the albums bearing their name and being underpaid, The Time would take to the stage with the purpose of up-showing Prince, much the same way Prince and his band undermined Rick James when they toured with him as James' opening act on the Rick James Tour '80. The tension came to a head on the final night of the tour in Cincinnati during The Time's set when Prince and some of his cronies egged their support act from off-stage. Things further escalated after The Time's performance when guitarist Jesse Johnson was handcuffed to a wall-mounted coat rack and further humiliated. Prince, of course, demanded no interruptions during his performance, but as soon as he left the stage, a food fight erupted. When the battle continued at the hotel, Prince allegedly made Morris Day pay for all damages, claiming that he had started the whole thing. During the 1983's 1999 Tour, The Time were playing as Vanity 6's backing band from behind a curtain, before doing their own hour-long set with only a small pay increase. Jimmy Jam and Terry Lewis, who had begun writing songs and production work of their own (working with SOLAR to produce Klymaxx and with Tabu Records to produce The S.O.S. Band), were stranded in Atlanta by a blizzard and failed to make it to a Time concert in San Antonio. As result Jerome had to mime playing bass guitar on stage while Prince played Lewis' part off stage, and Lisa stood in for Jimmy Jam. Subsequently, the duo were fined and then fired after the tour finished. Although Prince would state in a 1990 Rolling Stone interview that he "didn't fire Jam and Lewis. Morris asked [him] what [he] would do in his situation. Remember, it was [Morris'] band." Whether their firing was due to the incident or to their increasing independence has never been cleared up. Monte Moir felt his loyalty was with Jam and Lewismore than with Prince and also left. The three were replaced with Mark Cardenas and Paul Peterson on keyboards and Rocky Harris on bass. Harris only remained the bass-player for a few weeks as he was fired when he failed to show up on time one day filming a scene for Purple Rain. He was quickly replaced by Jerry Hubbard. This new line up was featured in Prince's Purple Rain film. The Time rode the wave of popularity created by the movie and hit singles "Jungle Love" and "The Bird" and were household names in 1984. Unfortunately, the band was not to reap the benefits. It was Day who left next after arguments with Prince, choosing to pursue a solo career in 1985 after a successful acting turn in Purple Rain. Soon thereafter, with Jesse Johnson also opting to go solo (taking Time members Cardenas and Jerry with him), the band disintegrated; the remaining members (Jerome Benton, Jellybean Johnson and Paul Peterson) were subsequently reformed into a new short-lived project called The Family. Meanwhile, Jimmy Jam and Terry Lewis went on to become one of the most successful songwriting and production teams of the 80s and 90s. The members of The Time (barring Monte Moir) reunited in 1986 for Morris Day’s second solo album Daydreaming released in 1987. They are on two tracks written and produced by Jam & Lewis : "Fishnet" and "Love Is A Game". "Fishnet" became successful and hit number one spot in the R&B chart in 1988. The original line-up (minus Monte Moir) reunited again their first live performance together since 1983 at The Minnesota Black Music Awards in October 1987. In 1990, the original seven members of the band reunited for the Graffiti Bridge movie and soundtrack, as well as a new album, Pandemonium. In 1989, Jimmy Jam and Terry Lewis were recording with Morris Day, who also working with Prince on a different project at the same time called Corporate World, a planned fourth album for The Time. Corporate World was set to only feature Morris and Jerome, but Warner Bros. asked that the original line-up be brought in if Prince wanted the company's backing for the movie. This spawned their highest selling single, "Jerk Out" and the album featured more input from the band than any other Time album. The reunion was short-lived, however - clashes within the band caused them to disband once again. Morris and Jerome remained a team afterward, with both trying out some small acting roles over the next few years. After leaving The Time, Morris Day pursued a solo career as singer and actor. In 1990 he produced - together with Freeze and Benny Medina - a female band called The Day Zs. This all-female funk group, was fronted by former Mary Jane Girl Cheri' Wells for which he wrote and produced every song on the album. The Day Zs' released one and only self-titled album in 1990 on Reprise/Warner Bros. Records. He has also written tracks for other artists like Ying Yang Twins and appeared on Angel Grant album. Jesse Johnson also launched a solo, releasing albums, writing songs and producing acts such as Vanity, Sue Ann Carwell, Three Shades of Brown (as The Funky Mercenaries), Ta Mara & The Seen, dá Krash / Kool Skool, Wendy And Lisa. He is experienced in arranging, engineering, programming and producing and appeared on many albums by other artists like Janet Jackson, Paula Abdul, Rod Stewart, Les Rita Mitsouko. Jimmy Jam and Terry Lewis founded the labels Perspective Records and Flyte Tyme Records and became one of the most successful production teams, working with everyone from Full Force and Janet Jackson to the S.O.S. Band and Human League. To this day millions of sales on over 100 albums they produced have exceeded gold, platinum, and multi-platinum status. Their personal record include 15 No. #1 pop hits, 25 No. #1 R&B chart toppers, multiple Grammy Awards, and numerous other accolades and honors. Monte Moir followed the example of the pair, writing songs for Janet Jackson, Alexander O'Neal and Deja, and using his experience in arranging, engineering, programming and producing on many albums by other artists like Patty Austin, St. Paul, Deniece Williams, Cherrelle and the S.O.S. Band. Jellybean Johnson together with Susannah Melvoin, Jerome Benton and Paul Peterson joined a new Prince project: The Family. The band released a self-titled album in 1985 after which they split. He has written tracks for Alexander O'Neal, New Edition and Nona Hendryx, and is experienced in arranging, engineering, programming and producing. He appeared on many albums by other artists like Janet Jackson, Jill Jones, Karyn White, Herb Alpert and Mint Condition. 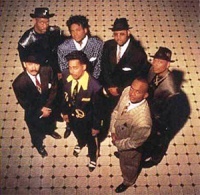 Several members of The Time reunited in 1995 , added a few new recruits and have remained together (as Morris Day & The Time) since. This version of the band can be seen in the Kevin Smith film Jay and Silent Bob Strike Back and tours frequently to this day. A fifth Time album is rumored to have been completed in the late 90's, recorded with the new lineup but production and coordination with Prince has prevented its release. The title Old Dogs, New Tricks was the working title. A 2004 album attributed to Morris Day called It's About Time contains a few new tracks written and performed by Day and a number of live performances by The Time. The Time reunited at The 50th Grammy Awards on February 10, 2008 in a medley featuring Rihanna and included Jungle Love. In June and July 2008, all of the original members of The Time (Morris Day, Jimmy Jam, Terry Lewis, Monte Moir, Jesse Johnson, Jellybean Johnson and Jerome Benton) reunited once again for a series of shows at the Flamingo Hotel and Casino in Las Vegas. In October 2011 they released a new The Time album Condensate without any Prince input. The album was released under the new moniker The Original 7ven, as Prince owned the rights to the band name The Time. In December 2011 Jesse Johnson announced he was leaving the band again, making their new name moot. This page was last modified on 3 September 2018, at 19:22.